I can't think of a title so I shall name this post "Fred" - Stop staring and start sewing! I can't think of a title so I shall name this post "Fred"
We decided to play hookie this morning and run out to my parents for donuts and coffee and a chance to enjoy the rain in the desert. They live at the base of Silly Mountain (yes, that's it's name!) 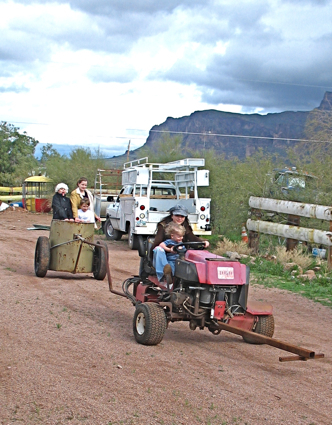 which is part of the Superstition Mountain Range (just a small part on the outside of the mountains). I could see the mountains clouded over from my house so we decided to make a run for it. I figured the mess would still be here when I came back (and wouldn't you know it, I was right!). 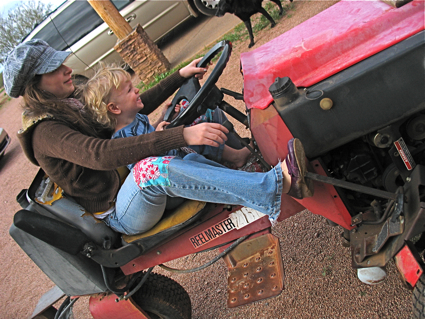 They have a couple of acres so the kids just sort of run loose and work off some energy. Here they all are riding the chariot. Farmers actually used these for races (they attach them to tractors) and my dad picked this one up at an auction. Yep, this is how we roll in Arizona. Check out the look on this little face. Born to be wild! I thought this was really cool. 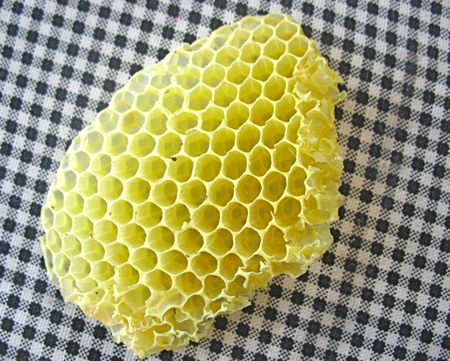 Joey removed a bee hive from some friends house over the weekend and brought this home for us all to see. A couple of years ago when he was laid off he worked as a pest control guy while he was waiting to get on his current job. So he does bees, termites, you name it, on the side but he really likes bees the best. In fact, last night he rented The Secret Life of Bees (he'd read the book when he started his bee kick). I cried and cried (extremely hormonal right now) and woke up with puffy eyes this morning. And I have a new hobby! 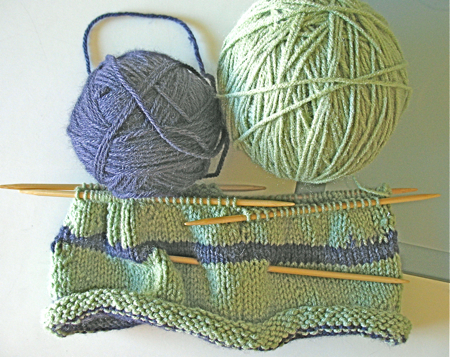 I've been spending hours and hours.....watching Joey knit! Yes, he's working hard at knitting a hat for the baby our toddler and has even joined the SMACK group on Ravelry. SMACK stands for: Straight Men Also Crochet and Knit! I love it! He may make a convert out of me yet. I had to be very sly about taking this picture so it's not so great because I was in a hurry. Nice, huh? 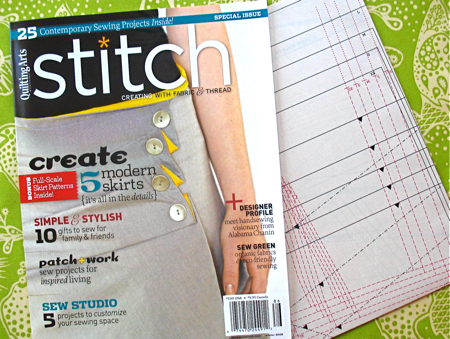 I found a fun new magazine at Joann's and although it seemed a little pricey (7.99), when I realized it included a pattern for the skirt on the cover (and some other versions) it was a bargain all of a sudden! This is their premier issue and if they're all this good I will definitely collect them. I'm sure the next issue will be great because it includes a gorgeous pillow pattern by Kay Whitt made from Paula Prass's fabric. Hubba hubba! Worth checking out! 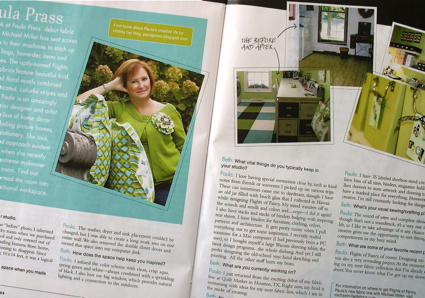 When I saw that the current issue of Sew News had an interview on Paula I had to have that too. And yes, she's working on a new fabric collection! There are some picture of her studio makeover in it but you need to go here to really see how stunning it all is. 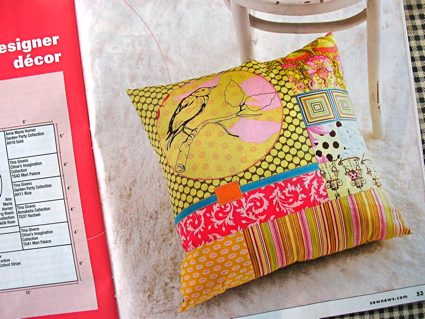 The magazine also has some great mini-articles on some of our favorite designers and then includes this pretty pillow pattern made with all of their fabrics together. Well now that I look at it, I don't see Tanya's fabric on it but maybe it's on the back? Yes, let's just say it's on the back! I think this would look great as a handbag too. Oh, and run over to You Go Girl! Cassie has a great tutorial up!